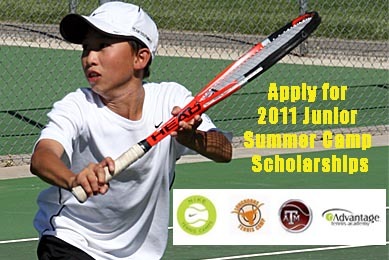 USTA Southwest is pleased to announce the 2011 Junior Summer Camp Scholarship Program. Applications for scholarships are now being accepted through April 11 for USTA Southwest junior players. USTA Southwest has made arrangements with some of the top tennis summer camps in America for our players to attend and receive instruction. These camps are the Nike Tennis Camps in Tucson, Ariz., the Longhorns Tennis Camp in Austin, Texas, Aggie Tennis Camp in College Station, Texas, and Advantage Tennis Academy in Irvine, Calif.
Click HERE to view the scholarship application. *NOTE: Due to NCAA regulations, recipients of scholarships to NIKE Tennis Camps, Longhorn Tennis Camps, and Aggie Tennis Camps must be under 14 years of age and not in or entering high school in the fall of 2011.